This casual Italian restaurant at the Clocktower Mall at Dockyard is a great place to come after you’ve had a good look around the shops here. Owner Livio Ferigo hails from Italy offers a menu that includes many of his favourite childhood dishes. The lunch menu includes pizzas, pasta dishes, burgers, soups, salads and sandwiches. At dinner there are more substantial entrees like Veal Rollantino (veal roulette Italian style) and Pollo Al Peperone (chicken breast in a pepper sauce). Café Amici is also open for breakfast and offers bagels, muffins, omelettes, and a full English breakfast. On Sunday mornings they serve a traditional Bermuda cod fish and potato breakfast. Summer opening hours (April to October) are 9 am to 10.30 pm daily. In the winter the restaurant is open 9 am to 9.30 pm on Friday and Saturday, and 9 am to 5 pm the rest of the week. Livio also owns the Bone Fish Bar and Grill. It’s also at Dockyard and offers live entertainment in the high season. Map showing location of Cafe Amici. Video of things to do and places to visit at Dockyard (King’s Wharf/Heritage Wharf). 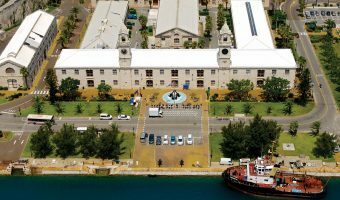 Includes the Bermuda Clayworks, Dockyard Glassworks, Bermuda Rum Cake Company, Dolphin Quest, Snorkel Park, and more.